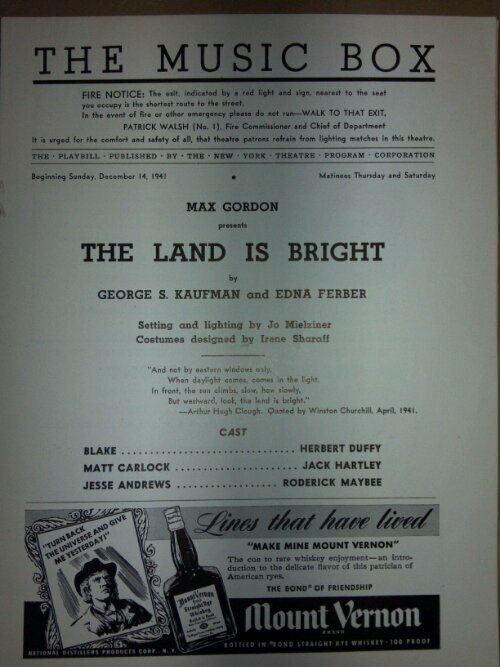 Playbill from “The Land is Bright”, December 1941. The play wasn’t a huge success, and one of Kaufman’s few dramas. George S. Kaufman, the prolific writer, director, and producer was nearly single-handedly responsible for Broadway comedy during the pre-Neil Simon years. His plays include The Man Who Came to Dinner, Stage Door, George Washington Slept Here, The Royal Family, and Pulitzer Prize winners Of Thee I Sing (the first musical to receive the prize) and You Can’t Take it With You (a bona fide classic). He is also responsible for the Marx Brothers’ films Animal Crackers and A Night at the Opera. Kaufman’s dry sense and wit transferred perfectly over to the Marx Brothers (and, clearly, the rest of America). And he won the Tony Award for directing Guys and Dolls. He was terrific at collaboration – in fact, all of the plays mentioned above (and the ones I’m about to mention) were written with someone else. This was not because of lack of ability – he was immensely talented, and found equally talented people to work with. Like a supergroup. He was a member of the Algonquin Round Table, a group of writers that met regularly at the Algonquin Hotel in New York City to discuss stories and their latest projects. One of the regulars was Edna Ferber, the writer who wrote the novel Show Boat (the one that was turned into the musical of the same name). Their third collaboration was the 1941 play The Land is Bright. Never heard of it? Don’t worry – after 1942, no one has. There are no new printings of this play – it only exists in manuscript form. It’s a lost gem of the Kaufman canon, I believe (and since no one has heard of it, I’m reasonably sure that I’m correct). The story revolves around a family of robber barons from the midwest who move to New York City in the 1890s. They build a huge mansion on 5th Avenue – like so many of the new rich did – and live in a grand style. The means by which they “earned” their money is questionable, and it’s indicated that it may have been through illicit and illegal means. The action of the first act suggests that the patriarch, Lacey Kincaid, may have robbed and murdered his way to the top – and the act ends with the audience believing that this may be true. The second and third acts follow the family over the next few generations, a dramatic technique that is gutsy, but works really well to show the changes in the characters. The second act takes place roughly 25 years later, with the eldest son, Grant, taking over the family and keeping the clan in check. He doesn’t do a very good job of it, since his sister, Tana, who is known throughout the family for spending wads on cash on unnecessary luxuries and husbands of ill repute, calls him out on his lack of responsibility (she is clearly a hypocrite). His children are failures and messing around with criminals. It seems that everything is falling apart. Raise the curtain for the third act. The early 1940s. Grant is old. Tana is old, yet still gallivanting around Europe with various Dukes and Earls, and other expensive people. There is now a litter of children and grandchildren, all growing up and trying to use their money for good, charitable things. It takes Wayne Kincaid, Grant’s oldest, to set things straight. They want to sell the house, the “mausoleum”, and turn it over to a good cause. The great-grandchildren of Lacey Kincaid are finally cleaning up his mess. Enter Lacey Kincaid II. A soldier, about to go help out with the war effort, offers the last comforting words to his old grandpa Grant – that everything will be fine – and Grant curses his old age and what he has done with his life. It’s much better than my lackluster description. It has a lot of depth, many characters, and a unique storyline. I’m particularly fond of it, especially since no one has heard of it, and it’s by one of the most famous and successful writers in history. Nice little find. Another Kaufman non-comedy (I guess this next one could be a melodrama) is called The Dark Tower. This one was co-written with Alexander Woollcott, the critic and writer (and member of the Round Table). If creatively directed, it could be a fun play for the audience. The story is a little predictable, but I don’t want to give it away. Basically the plot revolves around a group of actors and a mysterious stranger. It was adapted into a film called The Man With Two Faces . Kinda kills the mystery, huh? If you can get your hands on one of the very old copies that still exist of this play (mine is from the 1930s and in rough shape), it’s worth the 2 hours to read. It’s always fun to explore the lesser known work of well known writers. The quality may not be the same as their more famous works, but even Kaufman’s obscure stuff is still better than a lot of other stuff out there. The same is true for plenty of other writers – go dig a little and you’re sure to find some gems. You could be “that director”.